…a network protocol used to transfer data from one computer to another through a network, such as the Internet. It all sounds a bit scary and technical (which no doubt it is behind the scenes), but luckily we don’t have to bother with all that, as there are tools that shield us from the complexities. I’m going to assume for the rest of this article that you’re using FileZilla, although a lot of the principles apply equally to other FTP software. Apart from FTP software, you also need to have FTP access to the web server where your site resides. Most web hosting packages provide this as default, but if you’re not sure you should check with your hosting provider. They need to provide you with a username and password you can use to gain access to your files on the web server via FTP (normally this is the same username and password you use for your cPanel). 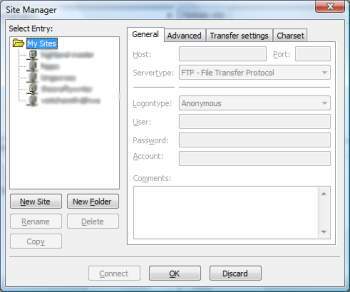 Launch FileZilla, then select File > Site Manager from the menu. This opens up the Site Manager dialog which is where you configure connection parameters for your web server. Press the New Site button. Type in a name for the connection (I normally use the name of the website). Enter the Host as your domain name (eg hippowebsolutions.com). For the Logontype, change Anonymous to Normal. In the User field, enter the username supplied to you by your web host. In the Password field, enter the password supplied to you by your web host. Finally click OK to save the configuration settings. To establish a connection to your web server, open the Site Manager dialog again, select the connection you configured in step 1, and click the Connect button. If all is well you should see some log messages scrolling by in the message log panel, and you will be connected to your web server. The main ones of interest are the local and remote Directory Trees and Folder Contents. Transferring a file from one to the other is as simple as double-clicking it. So to upload to the server (ie: transfer from left to right), double-click the file in the left pane, or right-click it and select Upload. Conversely, to download something from the server to your local machine, double-click the file in the right pane, or right-click it and select Download. Or you can drag items from one side to the other. You can also create and delete files and folders, transfer entire folders or groups of files, etc. Basically the same functionality you would expect to find in any file manager. Once you’re finished, and all transfers have completed (check the Transfer Queue to be sure), you can disconnect from the remote server by selecting the Server > Disconnect option from the menu. Most servers will also terminate the connection automatically after a period of inactivity. I hope that’s helped dispel any aura of difficulty about FTP. Basically, it’s as easy as moving files around your computer’s hard disk drive! Hi Rod. Here’s a punter who’s very pleased you’ve started this blog. I’m still new to it all and it drives me mad when terms like FTP are thrown into guidelines that are meant to be helpful, without any definition. You do a very good idiot’s guide, and this idiot’s looking forward to more. Cheers! Thanks Karen, you’re too kind. We’ll don’t mind giving credit & link back to your site. I still cannot quite figure out how to ‘activate’ a theme once I have transferred it onto my server? Please note you will have to upload the theme-folder to /blog/wp-content/themes folder, then only it will be listed in admin panel for wordpress. Make sure that theme folder has the theme files in it, and not to any other folders. Then only WordPress read it, else, it will not be listed in wp-admin. After uploading it, go to wp-admin > Design > Themes and it will show you all the themes you uploaded in above folder. Now just click on a theme you want to use, it will show you preview, and then find, “Activate theme” in the same preview window.. clicking this will activate selected theme for wp. A professional Web Design & Web Hosting Company based in Surat, India. I am very capable of using a filezilla or cuteftp but here is one thing which confused me. How to change permission on a file in windows server? I am pretty confused with that because we can change permissions in a Linux based hosting very easily. Leonardo: I haven’t used a Windows web server before, but you might find the answer to your question in this article about setting permissions. I prefer FireFTP Firefox addon to FileZilla because FireFTP is more lightweight and easy to use. I have heard a lot about Fireftp but I have been using Filezilla since 6 months. I think it is not heavy and it is the coolest ftp application I have ever used. In past, I have used Cuteftp but that is not a free application but it is very efficient. Response:	220 ProFTPD 1.3.1 Server ready. intan: sounds like either your username or password are incorrect – is your username really the full email address, or just balizstudio? And remember that usernames and passwords are case-sensitive. I suggest you contact your web host to make sure you’ve got the right username and password. You could also try Googling “ftp error 530″ – you’ll get loads of info. I have been using Firezilla almost since an year and I am very satisfied. One thing which always confuse me, active and passive mode, what is it actually and how it can be beneficial?